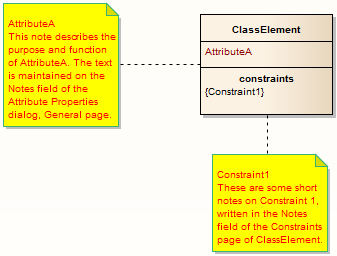 It is possible to connect a Note element to another element's internal documentation. This enables you to externalize model documentation to the diagram level, and as Enterprise Architect keeps the Note and the internal structure in synch, you do not have to update the Note; in fact, you are blocked from editing the Note text, because it is maintained automatically. In the example below, two notes are connected into an element's internal structures. One is connected to an attribute, and displays the attribute name and notes. The other is connected to a constraint, showing the constraint name and documentation. Click on the element and then click on the feature to link the Note to. Select the Element | Inline Features | Create Linked Note menu option. This creates a Note element linked to the selected feature, reflecting the content of that feature. Insert the target element into a diagram. Drag the Note icon from the Common page of the Toolbox onto the diagram, next to the target element. Do not type any text, just click on the OK button. Click on the Note Link icon from the Common page of the Toolbox. Click on the Note, and drag across to the target element to create the connector. Right-click on the Note Link to display the context menu. Select the Link this Note to an Element Feature context menu option. The Link note to element feature dialog displays. In the Feature Type field, click on the drop-down arrow and select the type of feature to link to. In the Feature list, click on the specific feature to link to. The note now automatically derives its contents from the target element.